Dr. Sherry Steinmetz is a first-class dentist who practices cosmetic, sedation, sleep dentistry (the treatment of obstructive sleep apnea and snoring), TMJ/ TMD treatments, as well as general dentistry in the greater San Francisco Bay Area. 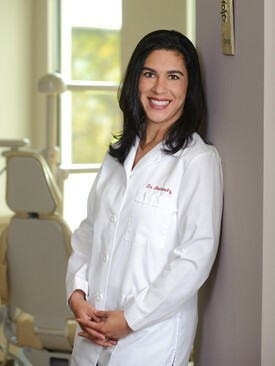 Dr. Steinmetz received her Bachelor of Science degree in Biology from the University of California at Riverside, and her Doctor of Dental Surgery degree from the renowned University of the Pacific, Arthur A. Dugoni School of Dentistry, where she graduated with honors. Her commitment to continuing education is what sets her apart from other dentists. She understands the importance of quality care by keeping up to date with research and technologies. She and her dedicated team are continually attending postgraduate dental education seminars to learn the latest in dental advancements. Dr. Steinmetz is a graduate of the Las Vegas Institute for Advanced Dental Studies where she advanced her education in cosmetic dentistry and TMJ / TMD disorders. She is one of an elite group of dentists certified in California to perform oral conscious sedation, and in February 2011 Dr. Steinmetz was awarded the honorable Fellowship in Sedation Dentistry from the Dental Organization for Conscious Sedation (DOCS). In order to be awarded this prestigious title, Dr. Steinmetz completed advanced training and was proven to have met the depth of experience and rigorous educational requirements. She is one of only 10 doctors in the State of California to have achieved this high honor. Dr. Steinmetz and her team are dedicated to providing quality, comprehensive dental care with superior customer service. They respect each guest that enters their office and treat them with the utmost care and professionalism. Dr. Steinmetz is married with two lovely children, Cameron and Lily, who keep her very busy outside of the practice. In her spare time, she enjoys visiting with family and friends, volunteering at her children's school and scuba diving. You may view Dr. Steinmetz's Smile Gallery to see photos of smiles she has transformed and read Patient Reviews from actual patients.